Find hotel near Monumento A La Maria Mula .. The bird Quiscalus mexicanus, known as ‘quiscal’ in some places, is a cute black specimen of the avian world. In Columbia, it is also the symbol that represents the fauna of the country. This bronze park sculpture is one the five found around the country. The others are in Barranquilla, Valledupar, Medellín and Cali. 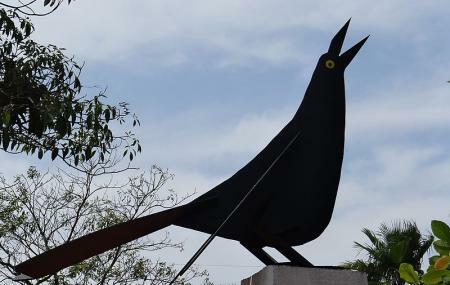 They are all the work of the sculptor Enrique Grau, who imagine the song of the bird is ubiquitous throughout the country, inextricable from the lives of the citizens. This one was inaugurated on August 30, 1997. There is not much else to do here so take a picture and move on. Buen lugar para visitar y cerca hay tiendas de artesanías y también está muy cerca del centro histórico de Cartagena el cual se debe visitar..